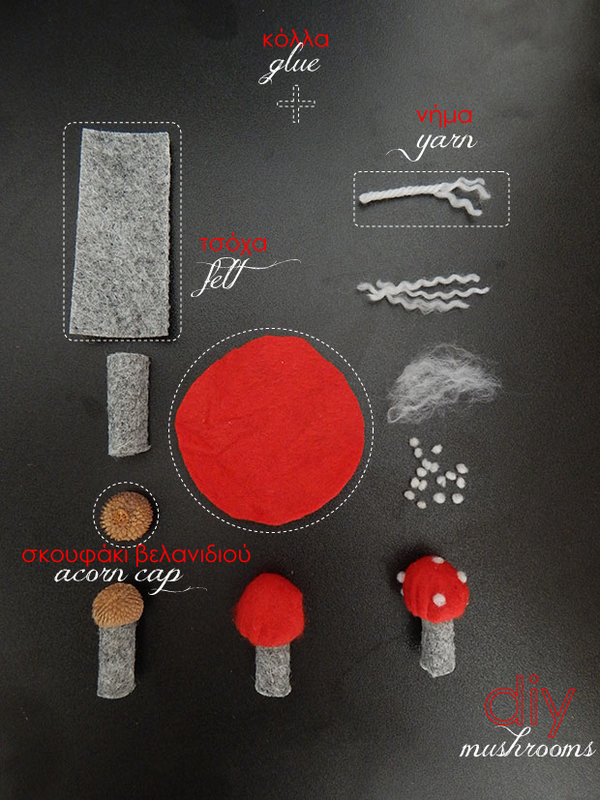 DIY Felted Mushrooms for Christmas!!!! Do you like mushrooms? I adore them…I can eat thousands of them and I can have them in my home decor. I do not know why I love them so much…maybe because I was a fan of Smurfs! 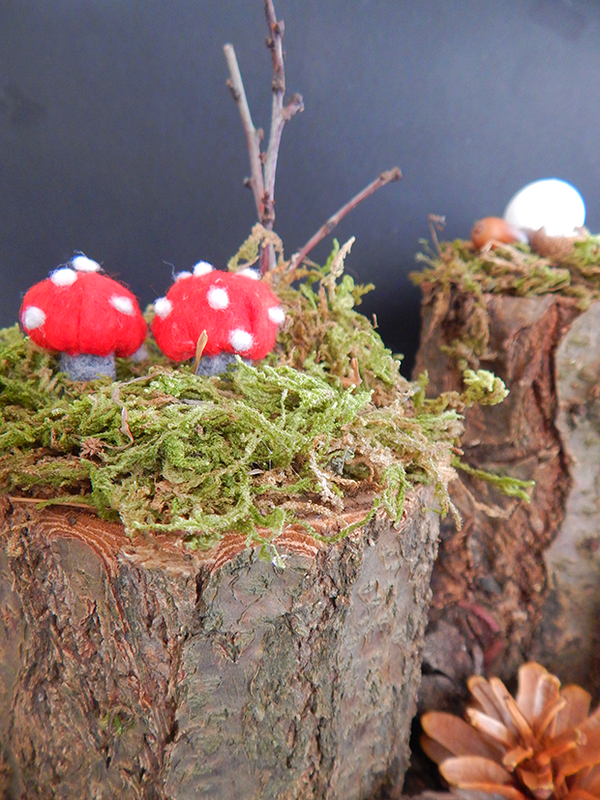 A great friend just joined my blog and she has an amazing tutorial how to craft your own small mushrooms for your Christmas decor… and not only! Hello ladies. I am really happy to be once again at Zina’s beautiful blog, especially at this time of the year. Festive preparations and decorations have already started and if you are like me and love themed Christmas decor, then you will surely adore this diy I’ve prepared. 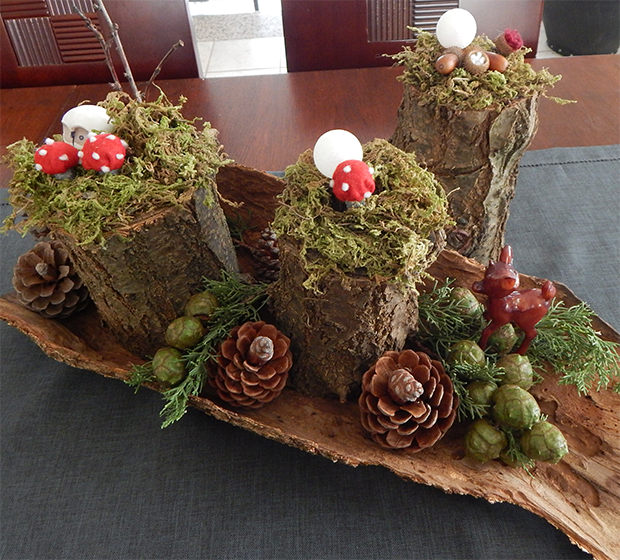 Woodland Christmas was my choice for this year’s decor and you can’t have a forest without mushrooms, can you? They are adorable and fairly easy to make. So let’s what you will need and how to make them. Roll a small piece of grey felt and attach it with a bit of glue to the acorn cap. Make some balls out of white yarn and attach them with glue to the cap. And if you are wondering what I did with my mushrooms, I used them for a dining room centepiece. I glued some dried moss to three logs and attached the mushrooms, some twigs and other woodland related pieces and placed them in a large piece of bark filled with pine cones and greenery. What do you think? Doesn’t it look like a miniature woodland? Do you theme decorate? What’s your theme for this Christmas? Happy holidays everybody! I hope you are having a great time! Aren’t they adorable????? And I love them in the decoration that Dimitra already added them! 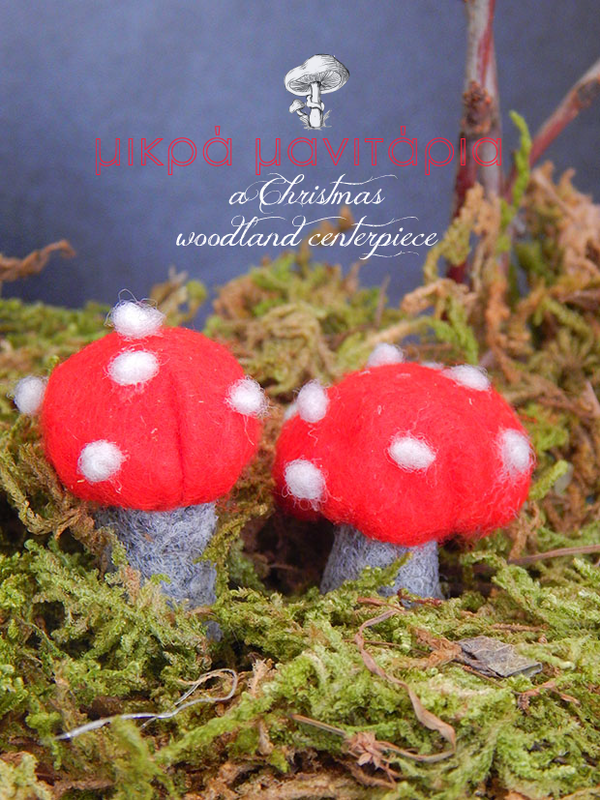 To be honest… I would keep this amazing woodland piece more than Christmas period!!! Dimitra has amazing ideas to share with you, so just discover her in her Asylum or in her Facebook Asylum… or in her g+ Asylum or in her pinterest one…she is everywhere!!! !